This is the eighth chapter of The Architects Guide to Choosing the Right Carpet. First of all, determine the desired carpet life for the project. In all likelihood, the longer the lease, the higher quality carpet will be required. A quality commercial carpet typically has a life expectancy of 10-20 years. It will remain looking good throughout this period if specified correctly and maintained regularly. If soiling and spills are a particularly big issue, and your client is keen on keeping a spotless carpet, consider carpet tiles. They are significantly easier to replace than pieces of a wall to wall carpet. Next, determine the levels of use for each particular area of the project. Pay close attention to foot traffic and the movement of furniture, especially furniture on castors. Private offices and conference rooms may only have light to moderate use, while corridors and common areas may receive heavy use. 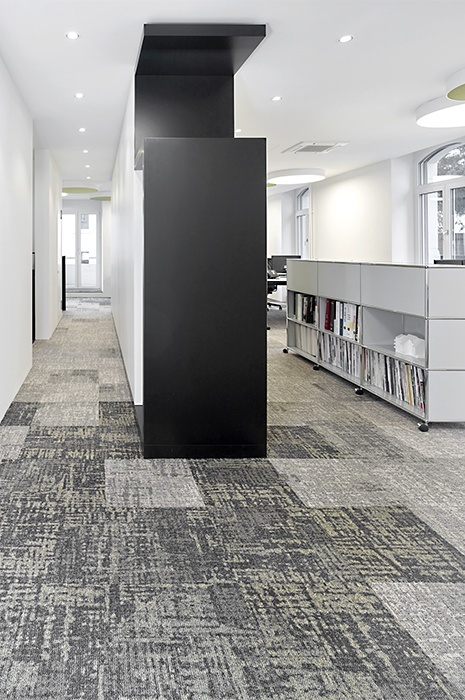 In a future blogpost we´ll delve deeper into the classifications of commercial carpet for different levels of usage, acoustic qualities and other performance attributes that may be required for different areas of your office project. Your carpet supplier should be more than willing to provide you with samples. These can be viewed in the intended space or under the same type of lighting used in the building, as different types of lighting can drastically affect the look and colour tone of your chosen carpet. Taking samples on site also allows you to play around and refine the overall flooring design. Make sure that the sample is made in the same quality as specified for the final carpet as it will also influence the look and feel. If you have a specific project in mind already, you´ll find plenty of samlpes here to test your interior design ideas. High quality commercial carpet generally offers good stain resistance properties. Nevertheless, it’s a good idea to test a few samples for how well the design or colour hides stains and soiling. This is especially important for areas such as cafeterias and corridors with heavy foot traffic. Be aware that samples are mainly made for design and colour check and may not have the anti-soil treatment that will come with the final carpet. The optimum choices are colour values falling into the medium range, neither so dark they show up light stains nor so light that they show up dark stains. Medium range colours offer little contrast to any accumulated soil and do the best job of concealing daily soil build-up and stains. Also test if typical stains, such as spilt coffee, are easy to get out for daily spot removal. If soiling and spills are a particularly big issue, and your client is keen on keeping a spotless carpet, consider carpet tiles. They are significantly easier to replace than pieces of a wall to wall carpet. On a general note see our maintenance guide, to give your carpets the best conditions to last for many years to come. Backing is perhaps the most important aspect to consider, as it has all or most of the selling points you can tell your client, for why carpets are perfect for offices. For one, cushion backing increases underfoot comfort, which alleviates back pain from standing. It also absorbs the impact of foot traffic, allowing the fibres to look better and last longer. Backing also plays a key role in acoustics, which is why some manufacturers offer specially designed carpet backings optimized for acoustic dampening. The acoustic aspect is always important, but in office projects this is more so. Backing also helps set the mood of certain areas, and you can even consider adding details like an extra plush backing in the lounge areas, to give that subtle tactile sensation of added comfort. Regardless of your ambitions and carpet expertise, we recommend that you consult with your carpet supplier to be sure you specify the right backing for each end use area, as it is such a critical part of an office carpet. 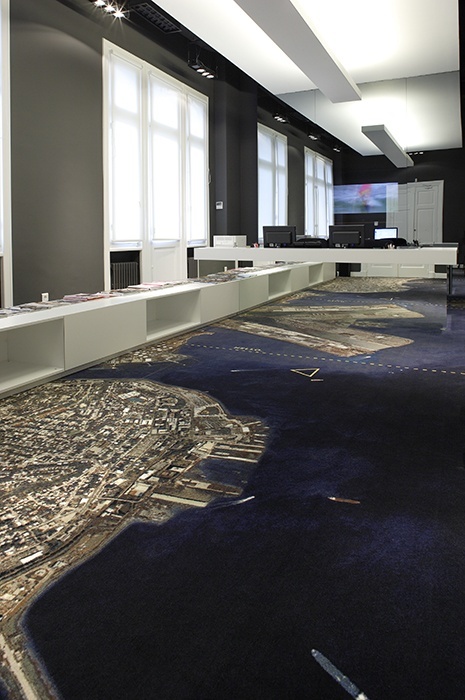 Carpet installations for large office environments can be complex and mistakes are expensive and cause costly delays. Prepare a detailed carpet placement plan and have your carpet supplier check it to ensure all details are correct – especially with wall to wall carpet where extreme care needs to be made with seam placement and direction for optimal results. Costly mistakes are common at the installation stage unless careful preparations are made. Make sure you have all details in hand from your carpet supplier and carpet installer prior to delivery. Have a logistics plan in place and take into account any delays such as the 24 hour wait time for wall to wall carpet to settle flat and carpet tiles to acclimatise before installation and whether the space will require airing for 48 hours or more after installation due to the type of adhesives used. 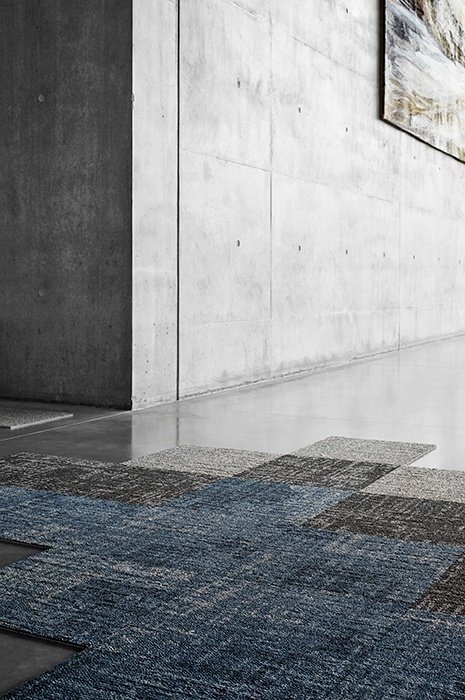 In our next blogpost we´ll cover similar steps to choosing carpets for hospitality projects.